Circular techniques such as round house kicks, knife hand strikes and spinning techniques have completely different type of requirements. In this case the acceleration and resulting velocity are generated by a rotational force or torque mostly generated in the hips. Whereas in linear techniques the body dynamics are more of a pushing action in the circular techniques they are more of a pulling action. The rotation of the hips builds up dynamic tension which pulls the arm or leg through the motion almost like a bungee cord stretching and pulling. Also, circular techniques typically go through a farther distance and have longer to accelerate so reach higher velocities and hence more energy. This is why a spinning technique can have a lot more impact. A circular technique can be done the more simple way with the limb fully extended through the entire technique as in a wheel kick. However, to achieve more impact the striking limb can be chambered and extended with the technique. This adds the extension velocity to the velocity created with the turn. It also has the added advantage of hiding the technique until you extend. The downside is that spinning techniques are more physically complicated and require more coordination. So it has to be determined if the benefit outweighs the additional complexity. As is usually the case circular hand techniques are easier to do than leg techniques for most practitioners. Similar to linear techniques it is important to contact the target at the point of maximum velocity. 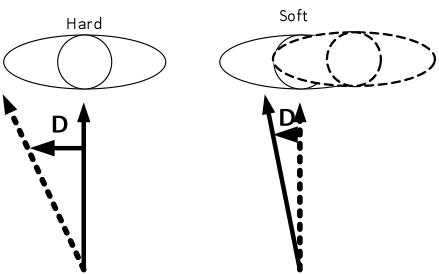 Since the circular techniques generally travel more distance then the ‘sweet spot’ for optimum impact will be larger especially in a spin technique. As an example a person with a 34 inch waist height doing a side kick may have their foot travel half of that or 17 inches from chamber to full extension. The same person doing a spin hook kick could have their foot travel 100 inches. This assumes the distance the full 34 inch extension traces out through a half of a full rotation. The red highlights in Figure 5 below show the difference between the effective contact zone for a spin hook kick compared to a simple side kick. This does not mean that one type of technique is preferable to any other. The choice depends on the situation. In terms of defending against an attack there are two basic options. One is avoidance and the other is to block. In the case of blocking there are hard blocks and passive blocks. The hard block is what we typically think of when we think of a block. The defender uses a part of his body to forcefully stop or redirect the attackers striking implement. A passive block is also a redirection but, as will be discussed later in a much less forceful manner. The physics involved in a hard block are quite obvious and often quite painful. In a block that is a forceful direct stop you have either two moving objects colliding or a moving object (the attacking implement) colliding into a stationary object (the blocking implement). In either case both objects will receive a significant amount of the kinetic energy. So the attack may be stopped but at a considerable cost. There are a number of ‘hard’ styles that engage in conditioning to be able to handle this situation. The hard and soft redirection blocks are basically the same and differ in how much force is required to change the path of the attack. Also, the soft redirect usually employs some avoidance to balance the reduced redirection by moving the target. The difference between the hard and soft redirection is shown in Figure 6 below. As you can see the hard redirect requires that the direction of the attack (D) be changed much more than the soft redirect. In both cases even if the redirect is not completely successful the contact is more likely going to be a glancing blow and not as effective. The difference is that in the hard redirect case if the block is totally missed the target will bear the full impact of the attack. However, in the soft redirect even if the block is totally missed the contact will still be a glancing blow and not as effective. Also in both cases the earlier in the path of the attack the defender makes his blocking contact the less force is required and the more successful the block will be. Of course this means that you have to recognize the attack earlier and respond fast enough. Another obvious defense is simple avoidance. Against a linear attack the possible choices of movement can be best broken down into seven directions that are practical as shown in Figure 7. They are available directions spaced at 45 degree increments. The direction moving directly into the attack (8) is useful to jam the attacker but is particularly dangerous. 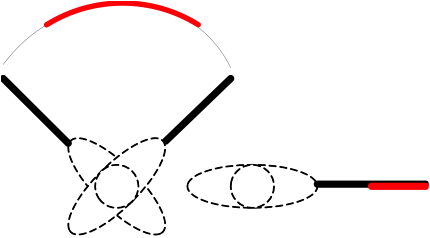 The red dashed circle shows the danger area defined as the area in which the defender can be reached by an attacker. This area moves as the attacker moves but for now we are only interested in the initial attack. For each direction that the defender may move there are both benefits and downsides. Directions 2 through 6 have the benefit that they move the defender outside the range of danger. Since you are increasing the distance it increases the available response time. The downside is that it also puts the defender outside the range of an effective counter. He has to re-enter the danger area to respond. The best way to do this is to enter behind the attack while the attacker is still engaged in his attacking motion and would have more difficulty defending. This is true if the target of your counter is the opponent’s body. In some martial arts in this situation the response is to attack and destroy the attacking implement (arm or leg). This is referred to as ‘defanging the snake’. This is practical in a real combat situation but is illegal in Taekwondo competition sparring. Directions 1 and 7 will move the defender into position for an effective counter but they are dangerous because you are closing in on the attacker which shortens your available response time. If your timing is off or you misjudge the speed of your attacker the results could be bad. In a competition environment this only results in a loss. In an actual combat situation it could result in a loss of life. In terms of a circular attack Figure 7 is still applicable with the addition that the eighth direction, directly into the attacker is now more viable. 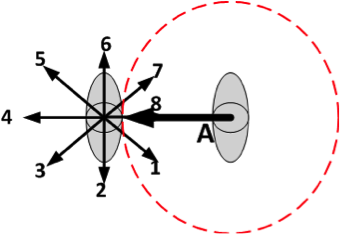 Referring to Figure 7 a circular attack would travel along the arc of the red circle from either the left or right. Let’s assume that we are the defender and the attack is coming from our left. In this case if we move in the 6 or 7 direction we are moving into the attack which, unless we are planning on jamming the attack is not a good move. The safest directions to move are 2, 3 and 4 since they optimally are moving away from the direction and out of the arc of the attack. Moving in directions 1 or 8 move you inside the arc so put you in the best position for a counter attack. By moving inside the arc even if you get hit by the attacking arm or leg the point of contact will be going slower than the hand or foot. If you close to half the distance then the speed at the point of contact will be half that of the maximum. Additionally, if moving in direction 1 part of your motion vector will be in the same direction at the attack which will further reduce the relative contact speed. All of this is second nature to long-term practitioners of martial arts but most probably don’t think of the science involved. This has been developed through centuries of trial and error in numerous martial art styles. And until recent history if your techniques were not effective it was not just a competition that you lost but possibly your life. If you think in terms of the scientific principles involved in techniques it will be possible to understand their basis and determine how to get the most effectiveness. Written by Master William Humbel. Master Humbel has been practicing martial arts most of his life. He holds master ranks in both Taekwondo and Kali. When not practicing these, he spends most of his time at work designing various components for spacecraft.